A man has who continued to breach behaviour orders which banned him from parts of Worksop has been issued with a further, more serious order. 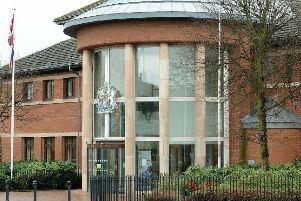 Martin Heath, 38, of no fixed address, was issued with the Criminal Behaviour Order by Mansfield Magistrates Court after he entered Farmfoods in Worksop on six occasions while he was prohibited from doing by a separate order. The new order prohibits Heath from entering any retail premises within the town centre, and he is also not allowed to enter the hatched area as detailed in the map. It was reported in September that Heath entered Farmfoods in Worksop on six occasions which he was prohibited from doing by a criminal behaviour order. He also assaulted a man on Victoria Square, Worksop, and he also used threatening or insulting words or behaviour towards a man on Bridge Place, Worksop. He was also in the company of a man in Worksop Town Centre on three occasions which he was prohibited from doing. Without a reasonable excuse he also entered Greggs on Bridge Place, Worksop twice. Sentenced to 18 weeks in prison and ordered to pay a £115 surcharge.